Thrushes and chats are found almost throughout the world's land masses, with their greatest diversity in the tropics of Africa and Asia. Many are much-loved species in their native lands. The relationship of some groups such as the solitaires (Myadestes) and forktails (Enicurinae) within the family is contentious. Discussion of groups is somewhat hampered by the complication of English names, especially the use of the word robin to describe species that have some red in the plumage (thus resembling the Eurasian robin, Erithacus rebecula) or groups of species that have a robin-like shape (hence bush robins, also sometimes termed bush chats and robin chats). Chats, generally smaller, stockier birds than most thrushes, include some well-marked groups such as 10 species of bush robins, three typical robins (Erithacus), a dozen nightingales and similar species, 13 robin chats, 11 redstarts, 11 stonechats, three bluebirds, and 19 wheatears. All of these are well-defined and recognizable groups sharing distinctive features. Some 164 species of chats are found in the Old World, and 87 in Eurasia, while only the solitaires, the three bluebirds, a bluethroat, and a wheatear are native to the New World. Thrushes comprise 15 genera with a dozen rock thrushes, 26 mountain and ground thrushes (Zoothera), 10 small so-called nightingale-thrushes (Catharus), and approximately 64 typical thrushes (Turdus). Of all of these, 55 species are Eurasian, 21-25 are found in the Afrotropics, and 46 in the Americas. 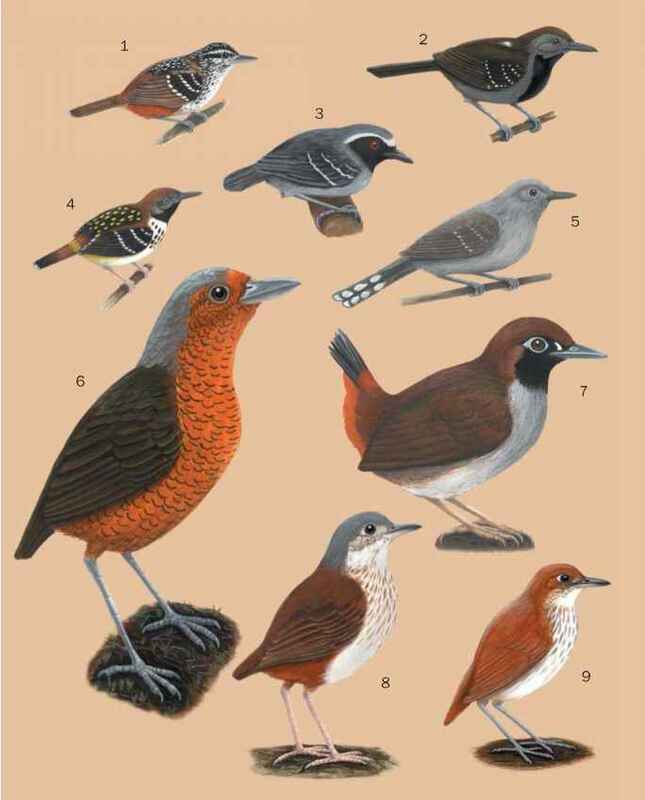 This distribution of species implies that the Palearctic, basically Europe and much of Asia, is the center from which thrushes evolved and spread, with a secondary center in Africa, perhaps particularly so for chats. New World thrushes probably evolved after invasions from the Old World. Most recently, the northern wheatear (Oenanthe oenanthe) and the bluethroat (Luscinia svecica) have expanded their range into North America. Similarly, thrushes have expanded from Asia into Oriental regions and Australia and, in the far distant past, reached a number of isolated island groups, including the Seychelles in the Indian Ocean and Hawaii in the Pacific, where unique species have evolved. Some isolated forms have since become among the most threatened bird species in the world. Long-distance flights to isolated islands are not difficult for this strong-flying group: American and eastern Asian species turn up each fall in northwest Europe, for example, far from their normal range.